Given that California recently became the third state in the US to legalize driverless cars, it should come as no surprise that automakers are attempting to jockey for the lead in what promises to be a tight race into an emerging driverless car market. And although we haven’t seen them perform yet, we do know that our two new entries have one thing: style. Toyota and Audi will be showcasing driverless luxury cars at the International Consumer Electronics Show next week in Las Vegas. Toyota will be rolling out a modified Lexus LS 600h hybrid. 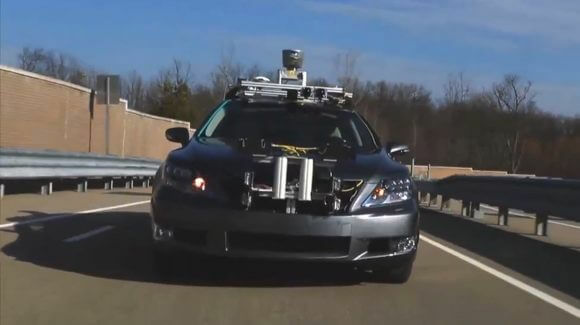 Like Google’s driverless Prius the Lexus uses radar, cameras and a laser range finder to navigate road lanes, traffic lights and signs, as well as avoid other vehicles on the road. Audi isn’t offering much specifics on their new car. We saw a driverless Audi TTS race up Pike’s Peak a few years back and then we saw their really slick A2 concept car last year. A spokesman from the company does assure us, however, that the car will not only be able to drive itself, but it’ll be able to search the parking lot for a space and park itself. So, in the future, not only will the cars take us to the mall, it’ll drop us off curbside too. Sweet! Here’s Toyota’s teaser video for the conference. Toyota continues to lead the way in automotive innovation. Their Prius, Camry and Lexus hybrids were the top selling hybrids in 2012. And their first bid in the driverless car race, which one market analyst said would likely go a long way in spurring the adoption of driverless cars, is sure to be followed by many others. Despite Prius being the car of choice for Google’s driverless car, both companies are developing their driverless technologies independently. The enterprising company has some horsepower in the electric car race as well. Earlier this year they revealed the RAV4 EV, a car Toyota developed in partnership with Tesla Motors. In addition to the new Toyota and Audi prototypes, an overall rise in automakers at this year’s Consumer Electronics Show suggests that automotive technologies in general are accelerating. A CES record seven of the top 10 automakers in the world will have exhibits at next week’s show, including newcomer Subaru. So, if you were wondering if driverless cars will ever hit the road, stop wondering. The aggressiveness with which automotive giants like Toyota and Audi are developing them and the speed at which states are paving the way with legislation point to a driverless car market that’s ripening quickly. And so far Florida, Nevada and California are doing their part to make sure that when the cars do hit the road, they’ll be rolling off lots in their states. No doubt other states are drafting legislation right now, lest they fall too far behind.